We may update this Policy from time to time. Policy changes can be found at the bottom of this page. If you keep using this website after a change, that means you accept this Policy. 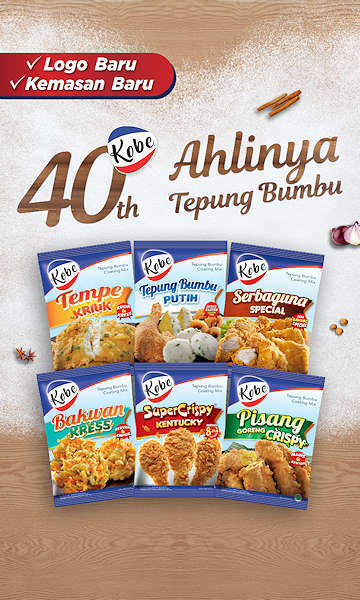 PT KOBE BOGA UTAMA, hereafter KOBE, is a food manufacturer and brand owner that strives to provide tasty, healthy and convenient food products to its customers worldwide. Information you provide by completing the vacancies form on this website — your name, email and postal addresses, telephone number, information about previous education(s), previous working experience(s), identity card, recent picture, CV and NPWP number. Information you provide to subscribe to our new recipes emails twice a week — your name, telephone number. You may decline to provide us with your information. However, this will limit your ability to contact us. We don’t keep any of the data that is sent via a form on our web server. The form data will be send through regular email and we receive it as a regular email. We collect and maintain aggregated, anonymized or pseudonymized information which we may retain indefinitely to protect the safety and security of our website, improve our services or comply with legal obligations. We use Google Analytics to analyze how users interact with our website so we can understand better what elements of the design are working well and which are not working so well. This allows us to improve and develop the quality of the online experience we offer all our users. This data cannot be traced back to a single person. If you don’t want you data to be collect by Google Analytics you should download browser add-on that can be found here https://tools.google.com/dlpage/gaoptout and install it. Further information and the applicable data protection provisions of Google may be retrieved under https://www.google.com/intl/en/policies/privacy/ and under http://www.google.com/analytics/terms/us.html. Google Analytics is further explained under the following link https://www.google.com/analytics/. There appears to be a session cookie. As soon as we know how to remove it we will. We don’t do anything with it. The session cookie will delete itself when you leave the website. Legitimate interests: This is a technical term in data protection law which essentially means we have a good and fair reason to use your data and we do so in ways which do not hurt your interests and rights. We sometimes require your data to pursue our legitimate interests in a way that might reasonably be expected as part of running our business and that does not materially impact your rights, freedom or interests. For example, we use identity, device, and location information to prevent fraud and abuse and to keep the services secure. We may also send you promotional communications about our Services, subject to your right to control whether we do so. Provision of Services. We need your name and email address to be able to contact you. When you apply for a job, we need the data to see if you are the one we are looking for. None of the information you provided through our contact form is shared publicly. We do reserve the right to disclose personal information when we believe that doing so is reasonably necessary to comply with the law or law enforcement, to prevent fraud or abuse, or to protect KOBE’s legal rights, property, or the safety of our websites or its employees. We will retain your information as long as necessary to provide you with the services or as otherwise set forth in this Policy. We will also retain and use this information as necessary for the purposes set out in this Policy and to the extent necessary to resolve disputes and protect KOBE’s legal rights. You can request a downloadable copy of your personal data at KOBE. To modify or delete the personal information you’ve provided to us, please fill in the form on this page with your request. We may retain certain information as required by law or as necessary for our legitimate business purposes. We want to communicate with you only if you want to hear from us. We try to keep emails to a minimum. We will send you an email relating to your question or remark that you provided using a form on our website. If you’ve subscribed to receive new recipes, we will send you a recipe email twice a week. If you have filled in a job application we may or may not contact you again accordingly. We take security seriously, and the security of your personal data is important to us. We follow industry-standard practices to protect the data we collect and maintain. No method of transmission over the internet or electronic storage is completely secure, so KOBE cannot guarantee its absolute security. We encourage the responsible disclosure of vulnerabilities of our website by emailing security@kobebogautama.com. Subject to applicable law, if you are a citizen or resident of the European Economic Area, you also have the right to (i) object to KOBE’s use of your personal information and (ii) lodge a complaint with your local data protection authority. KOBE does not knowingly collect any personal information from children under the age of 13. We are not allowed to store personal information of children under 13. Therefore, children under 13 are not permitted to subscribe to receive recipes or fill in a form on our website. If you believe that a child has provided us with personal information, please contact us at security@kobebogautama.com. If we become aware that a child under age 13 has provided us with personally identifiable information, we’ll delete it.